The announcement was designed by the parents, Tosh and Victoria Brown, and letterpress printed in four spot colors on Crane Lettra paper by The Mandate Press. 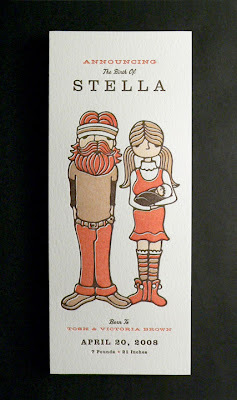 The overall design kind of reminds me of The Royal Tennenbaums, don't you think? Either way, I just love the simple, yet completely non-traditional and unique, design of this baby announcement.